We hadn’t intended to turn our trip into a Ludwig II pilgrimage, but soon found ourselves gripped by his unusual story and spectacular vision. 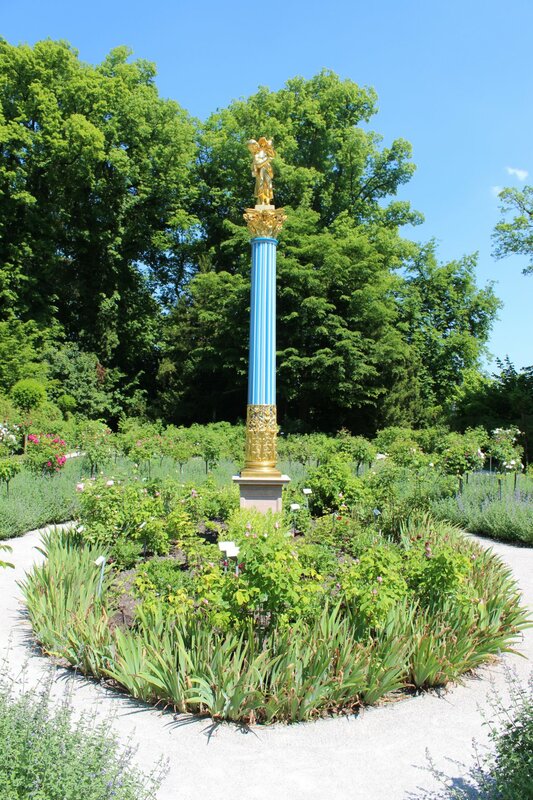 So, with this in mind, I thought I would wrap up our trip report with a quick run through of our self-guided Ludwig II tour for any souls contemplating a similar endeavour. Our tour could have been pretty expensive if it wasn’t for the 14 day passes from the Bavarian Department for State Palaces. A pass for two adults came to 44 euros, which compares incredibly favourably to the 127 euro bill we would have faced by paying for all our tickets individually. Children under the age of 18 are also included on this ticket at no extra charge. Ludwig was born on 25 August 1845 at Nymphenburg Palace, in the suburbs of Munich. The palace is easily reached by tram (Straßenbahn 17) and can be toured on a self-guided basis. The Queen’s Bedroom, where Ludwig entered the world, is one of the rooms open to visitors. The palace, park and park buildings are all delightful but the star attraction has to be the Marstall Museum’s collection of royal carriages. The Marstall Museum gave us our first glimpse into the world of Ludwig II with some of the most extravagant and ornate carriages and sleighs that can ever have existed. If they still have this effect on us today, how much more astonishing they must have seemed to Ludwig’s subjects in their time – especially with Ludwig’s preference for moonlit excursions! Ludwig’s childhood summer home was a real surprise to me, as I expected something quite plain and found an altogether more elaborate castle. Maximillian II clearly had a strong artistic vision like his son. It is striking that the two palaces are just a short distance from each other. 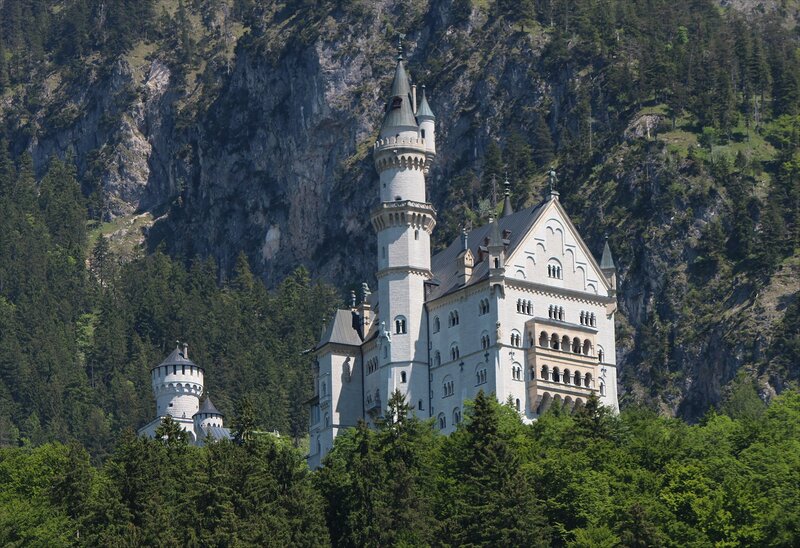 The castle can be visited on a hectic day trip from Munich or taken at a more leisurely pace with a stay in Füssen. I have written posts about our visit to Hohenschwangau and the pleasures of Füssen covering the practicalities in more detail. The Residenz is a marvellous complex to visit, but the apartment that King Ludwig had fitted out for himself between 1867 and 1869 (in the style of Louis XIV) was destroyed during World War II. 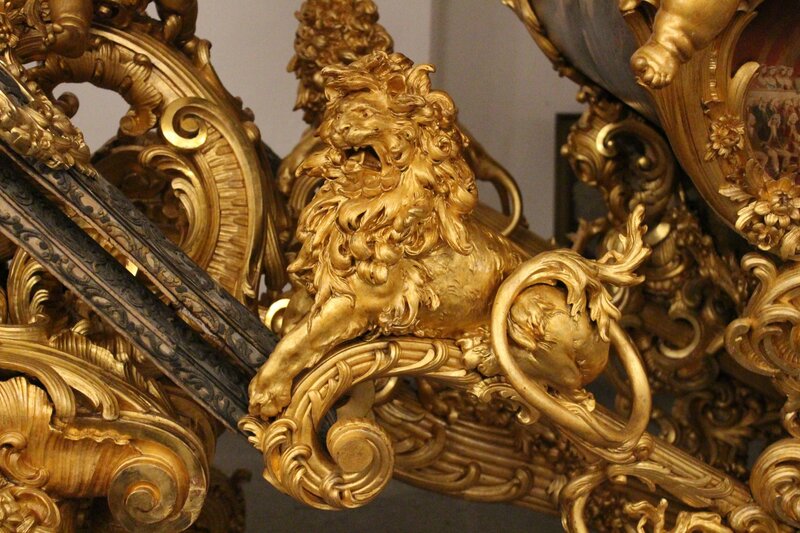 Thankfully, many of the moveable items of furniture and decoration were spared and can now be seen in three rooms of the museum at Herrenchiemsee. Ludwig’s other major construction here, the winter garden, has also long gone. The garden was a 70 metre long glass hall constructed on the roof of the palace, abutting Ludwig’s apartment. It was no ordinary conservatory, presenting a fantastical Indian landscape, complete with a Moorish Kiosk, a lake and a large illustionistic backdrop to extend the setting way beyond the space available. It was dismantled in 1897 but we can still get a good idea of its appearance from surviving photographs and a gondola preserved at the museum at Herrenchiemsee. 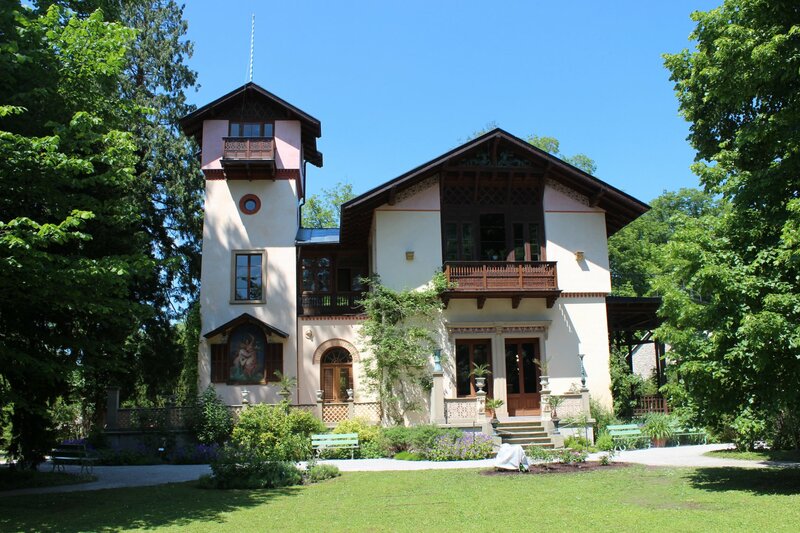 The secluded summer house, known as the ‘Casino’, on Roseninsel (Rose Island) was the only finished building from Maximillian II’s Feldafing Palace project. It doesn’t have the wow factor of the palaces, but it is easy to see why Ludwig II enjoyed this retreat. It’s a little off the well-trodden tourist path in Bavaria but worth a diversion if you have a spare day. I have written posts about our visit to the island with some practical tips. The modestly sized mansion at Linderhof, tucked away in the shadow of the Ammer mountains, was the only palace that Ludwig II lived to see completed. The palace was built and developed in stages between 1869 and 1885, growing out of the forester’s house constructed by his father Maximilian II. It must have presented a fascinating mix of styles in the early stages, blending the simplicity of an alpine house with splendour worthy of Versailles. All of this changed in 1874 when the alpine styled Royal Lodge was moved and the palace assumed the form that we see today. The Royal Lodge can still be visited for a small additional charge (free to holders of passes from the Bavarian Department for State Palaces) in the grounds, with a small museum about the history of the palace and park (the text of the displays is only in german, but english language translations handouts are available). Many of the coach tours that run from Munich offer limited time at the park, so we opted to use public transport instead (a train and two buses in each direction) and this worked out pretty smoothly. I covered our visit in the post Royal refuge in the Ammer mountains with some practical tips drawn from our experience. My personal highlight of the trail came with the visit to Neuschwanstein Castle. It is one of the most visited sights in Germany and there are plenty of downsides to this, but nothing can detract from the wonderful interior that (in my eyes) exceeds anything else that Ludwig II created. Don’t believe the reviewers who say that it is not worth taking the tour! 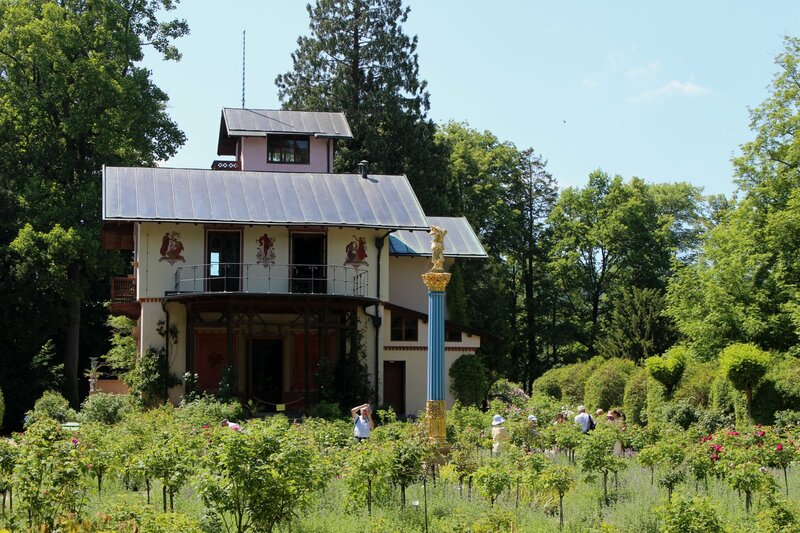 Ludwig II’s attempt to recreate Versailles on an island in Bavaria is quite extraordinary (a word that gets used alot on any tour of Ludwig’s palaces!) and delivers some of the most spectacular rooms I have ever seen. The tours may be short but every second in this palace counts. The opulence of Herrenchiemsee New Palace is in stark contrast to the relative simplicity of the King’s chambers in the Augustinian Monastery (Old Palace), which can be visited with a combination ticket. I summed up our astonished impressions in the blog post Versailles-am-see, though words are quite inadequate to describe this place! One sight that eluded us was the King’s House on Schachen, which is located 1,866 metres up in the Wetterstein mountains. It is difficult to reach at the best of times, as it can only be reached on foot and takes 6 to 7 hours to get there and back! 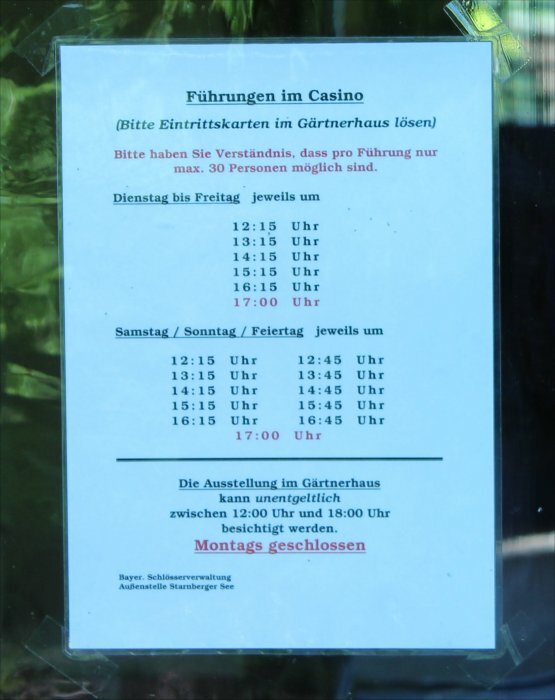 Whilst we were visiting the area many of the footpaths were closed because of the G7 summit, including those up to the King’s House, but this shouldn’t be a factor in anyone else’s visit! Guided tours are given during the summer months (in German only). The highlight is the upper floor, known as the Turkish Hall, which is a splendid vision of eastern delights. Berg Castle, where Ludwig was living at the end of his life, is still home to the Wittlesbach family and not open to the public (indeed, Ludwig’s gothic additions have long since been removed). 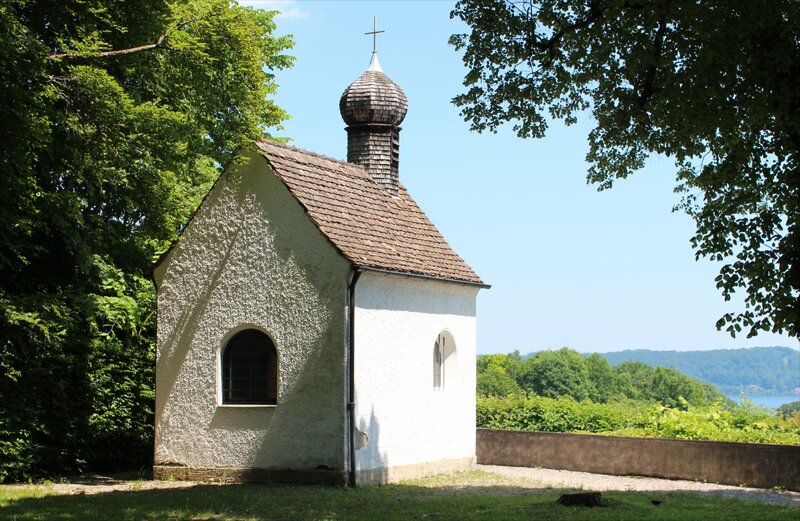 However, you can see the Votivkapelle (memorial chapel) constructed in his memory and the cross in the Starnberger See marking the spot where Ludwig died in mysterious circumstances on 13th June 1886, aged 40. We didn’t make it to Berg but it is relatively easy to reach by taking the S-Bahn to Starnberg, followed by a 12 minute ferry crossing. Ludwig was laid to rest in the crypt at the Michaelskirche in Munich on 19th June 1886 (though his heart was placed in an urn at the Gnadenkapelle at Altötting alongside those of his forebears). The crypt can be visited for a couple of euros. 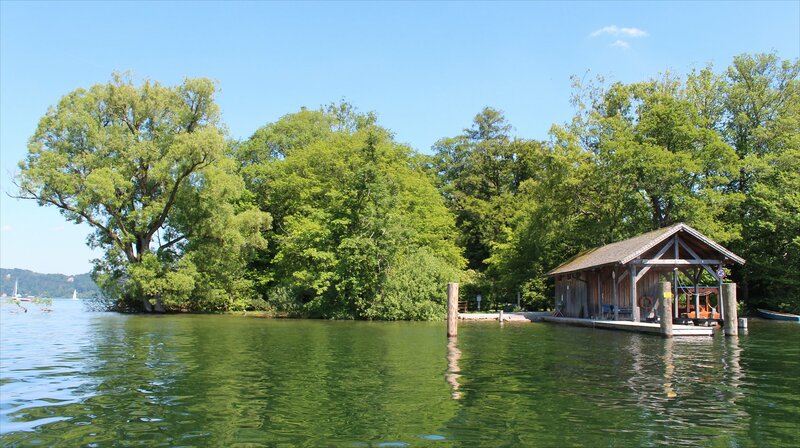 Our good progress with our sightseeing plans opened up the opportunity to make one last trip out of Munich and take a look at Feldafing Park, a spot on the Starnberger See where Maximillian II planned to build a massive summer palace. The early death of the king in 1864 stopped building work in its tracks. The palace had progressed no farther than the foundations (to be fair, construction only began in 1863) and the successful landscaping of the grounds. The project was abandoned and the untended park soon became wildly overgrown. It is said that the bricks from the foundations were removed to build the railway stations at Feldafing and Possenhofen, whilst the finest tree were transferred to Ludwig’s new palaces. Although the palace and park were lost to history, one element was completed and spared from neglect – a secluded garden retreat known as the ‘Casino’ situated on an island 160 metres from the shoreline. The island, better known today as Roseninsel (Rose Island), featured a small villa and a circular rose bed planted with over 1300 roses. Here, Ludwig II found the perfect location to entertain guests such as the Czarina Maria Alexandrovna and Empress Elizabeth of Austria. After the death of Ludwig II the island too succumbed to nature and the villa fell into disrepair. The island and park are now owned by the Bavarian state. Restoration work on the villa and rose garden started in 1998 and was sufficiently well progressed to be opened to the public in 2003, in time to celebrate the 150th anniversary, though the upper floor of the villa did not open until two years later. The island is now open to the public from May to October, though the best time of year to visit is around mid-June or mid-August to get the best of the rose blooms. They were just starting to come out when we visited, but must be wonderful at their peak. 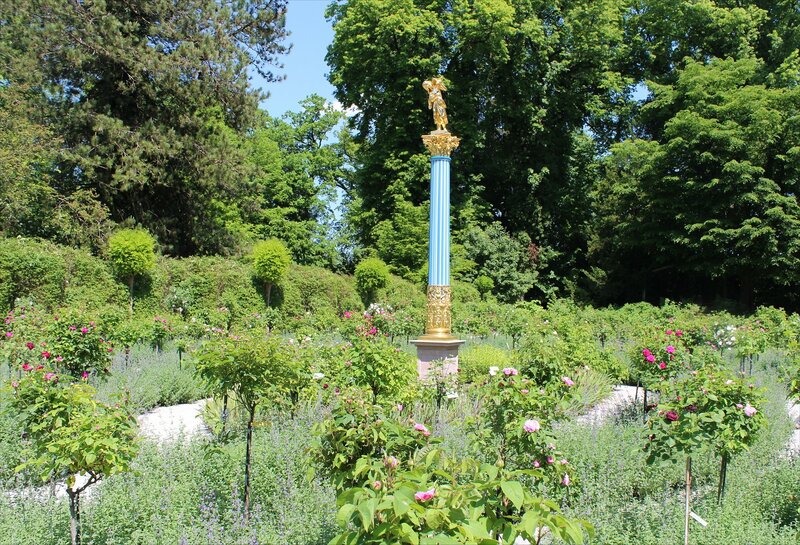 One distinctive feature of the garden is a 5 metre tall blue and white glass pillar, topped by a sculpture of a girl feeding a parrot, which was carefully restored in 2001. The original was one of three gifted by the Prussian King Friedrich Wilhelm IV (the others were installed at the Sanssouci Palace, Potsdam, and at Peterhof, outside St Petersburg). It certainly looks striking set amongst the circle of roses. The villa itself is an interesting place to visit, with some exquisite touches, even though it is much plainer than Hohenschwangau Castle. I particularly liked the wood-panelled dining room on the first floor which was decorated with wall paintings depicting the seasons, a ceramic fireplace held aloft by two figures and small statuettes of Victory atop wooden columns around the walls. It is all rather charming and must have been a wonderful place to get away from the pressures of court life. To get to Feldafing Park we took the S-Bahn (S6) to Feldafing. 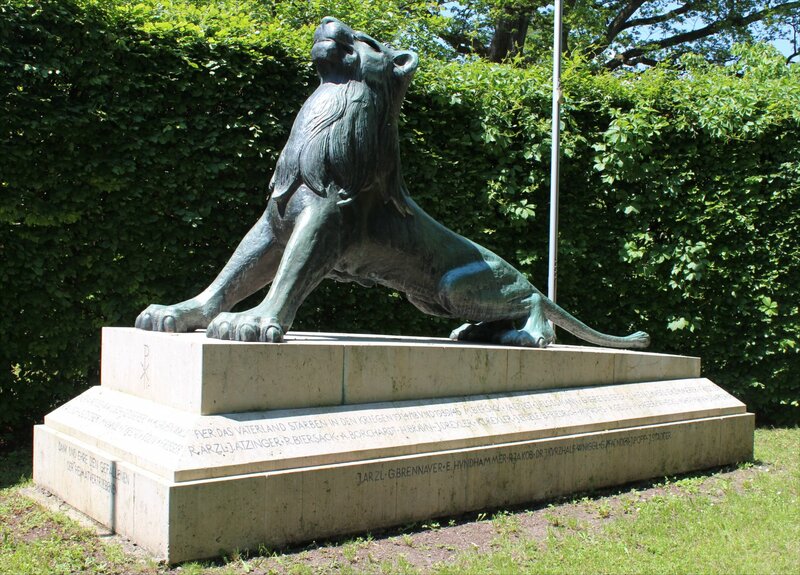 After leaving the station we walked along Bahnhof Strasse for a short way before taking a turning that led us onto a footpath ending at the Maffei-Kapelle and a rather splending war memorial (1951) nearby. From here we crossed Tutzinger Strasse and followed another footpath through the golf course which brought us to the landing stage for ferries to Roseninsel (Platanen-Rondell). I think there are a few variations on this route from the signs we saw along the way! 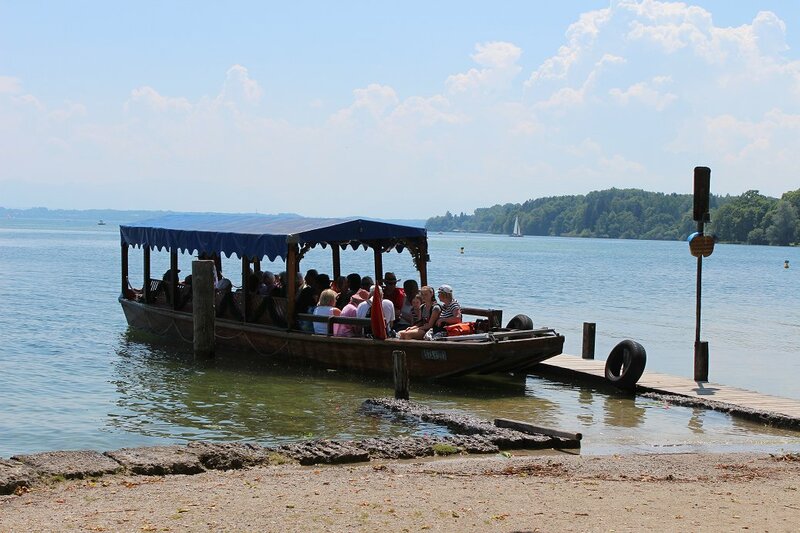 A small ferry runs visitors across the water on demand for a small charge (4 euros return) and tours of the villa are available in German during Tuesday-Sunday afternoons. Tours were running hourly on the day we visited (a Friday) at quarter past the hour and tickets should be purchased from the nearby gardener’s house. Our tour guide took us on a fairly leisurely tour around the property for around half an hour, covering the recent prehistoric finds and plantlife on the island, as much as on the history of the building itself. The small shop in the gardener’s house sells copies of the official guidebook (in German only) and a map guide to Feldafing Park and Rose Island (available in English and German). There is no cafe on the island, nor at the ferry stages, so any food or drink needs to be brought with you. Plenty of visitors seemed happy enough just to wander round the island or strip down to their trunks for a swim, rather than all coming to view the villa. Admittedly, it was 33 degrees on the day we arrived so I think the swimmers were quite right to ignore the interior!